So William has been wanting to go to the circus ever since he saw the preview of Madagascar 3, which involved a Chris-Rock-voiced zebra dressed in clown make-up and singing about his circus afro. Today my ever-resourceful husband found two for one tickets to the Shriner Circus. 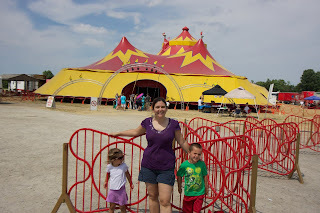 We crossed a field from the parking lot to an impressively large and colourful tent. I bought a program and got some clowns to autograph it. A booth outside the entrance sold used action figures and stuffies. William chose a batman and Jadzia a stuffed dog. Adam bought the Hulk. There was no Wonder Woman. Once inside the sweaty tent we chose seats in the front row, partially obscured by a support pillar. The kids were "hungry" so Adam bought them a popcorn and a snowcone to share. Later, he also bought them some large annoying balloons which they swung in the faces of their fellow spectators. Every treat left them wanting the next. There were so many things that we didn't partake in, cotton candy, light up swords, Dora balloons, face painting, elephant rides. The show itself was good. 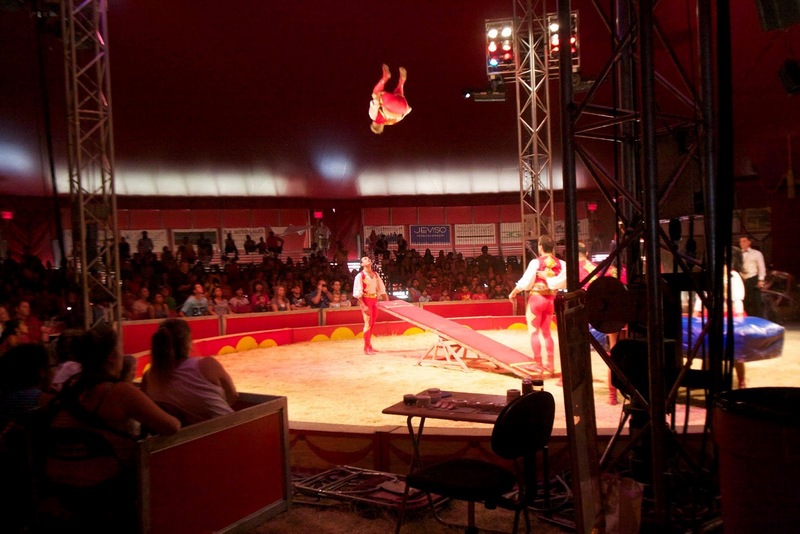 It had all the things you'd expect and want from a circus: trapeze artists, clowns, various trained animals. 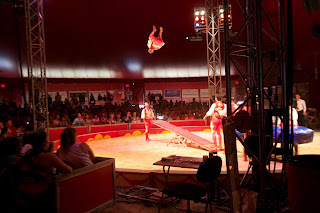 I enjoyed the guys who did flips through the air off this giant seesaw thing. Also the elephants. Jadzia had to leave to use the port-a-potty twice during the performance. The allergy pill I took left me exhausted and the heat didn't help, nor the whining, but all in all I'd call this a successful family outing.